Wisdom teeth are usually the very last teeth to appear, and while they usually arrive between the ages of 17 and 25, many people still have problems with them pushing through years later. Although adults can have up to 32 teeth, we rarely manage to fit more than 28 in at any one time, so if your mouth is already full when your wisdom teeth start cutting then you could be in for a bit of trouble. Wisdom teeth are situated at the very back of the teeth. If you have space for them to come through normally then you shouldn’t experience any problems other than mild discomfort when they actually cut. However, if there is limited space for them then this could mean that they come through at an unnatural angle, which could damage other teeth and cause you pain. When this happens your dentist will refer to it as an ‘impacted wisdom tooth’ and will likely recommend surgical intervention. Your dentist will probably also take some x-rays of your wisdom teeth in order to assess them as they are coming through to help decide if intervention will be necessary. Teething isn’t fun for adults either. 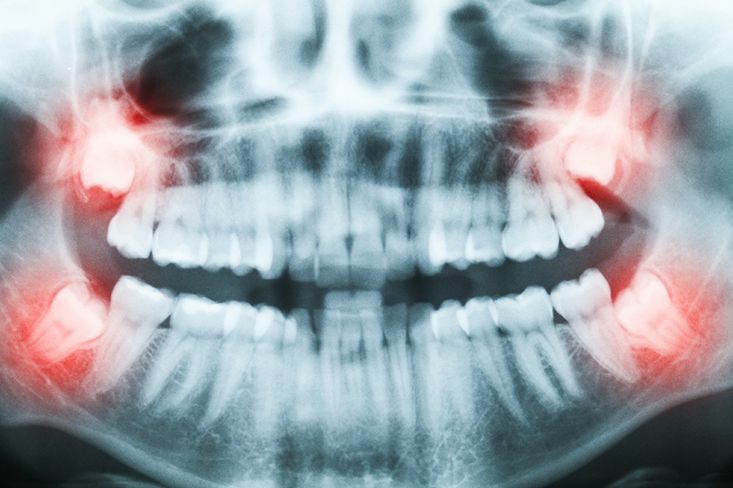 Wisdom teeth are large and cutting them may be a painful experience. They don’t necessarily all cut at once either. 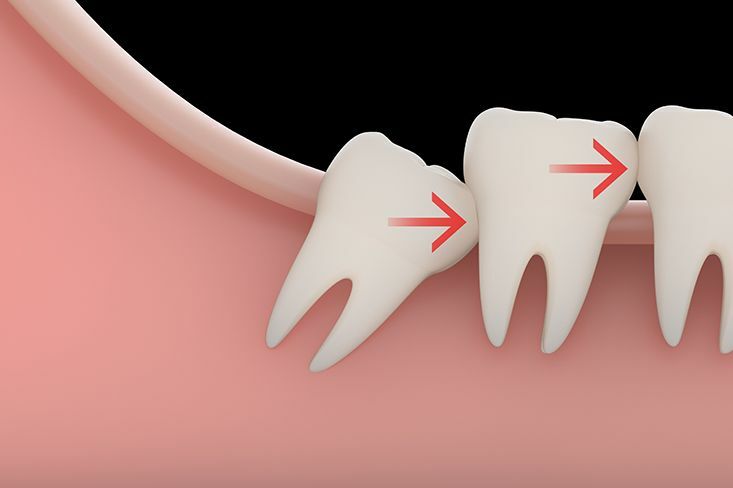 Wisdom teeth are made up of four sections and many people find that they cut one corner at a time. This is called pericoronitis. When the wisdom tooth comes through in this way, the gum surrounding the tooth often gets swollen and sore, causing mild to moderate pain. The gum edges are also susceptible to infection as tiny particles of food and bacteria can collect there, even when the area is thoroughly cleaned several times a day. Round head toothbrushes and antiseptic mouthwash can help prevent this from happening, but if your wisdom tooth does get infected you will require a course of antibiotics to completely clear the pain and infection. If you suffer from recurrent wisdom tooth infections, or your wisdom teeth are proving particularly difficult to get through, your dentist may recommend surgical intervention to remove the wisdom teeth altogether. Your wisdom teeth do not have the space to come through and will impact negatively upon your existing teeth if they do. If you are suffering from recurrent pain and infections requiring regular courses of antibiotic. If your wisdom teeth are damaged and decayed beyond use. What can I expect to happen in a wisdom tooth removal? Ahead of your oral surgery, your dentist will use your x-rays to check out the positioning of your wisdom teeth and their roots. Their position will determine how easy or difficult the procedure will be. Assuming you are having the surgery at your dentist’s office, you will be given a local anesthetic which will numb your mouth and eliminate any pain. If your surgery looks to be more complex, your dentist may refer to you to a specialist oral surgeon who will perform the procedure at a hospital instead. In these instances, general anesthetic may be offered to put you to sleep completely. In order to perform the extraction, it is necessary to open up the gum tissue and remove any bone that may be covering the tooth. Your dentist may choose to cut the tooth up into smaller sections if this makes the removal process easier. After your wisdom tooth is out your dentist may pack the area with gauze for a short while to stem any bleeding. This should have completely stopped within 24 hours. If it hasn’t then call your dentist to get advice. Your mouth may also remain number for several hours while the anesthetic wears off. You may be asked to refrain from smoking, eating anything too chewy or tough and from drinking alcohol for at least 24 hours to give the wound time to heal. You should also avoid lying flat and doing any physical exercise as this may prolong any bleeding. Your dentist may suggest an anti-inflammatory analgesic as your mouth could be swollen for several days after the surgery. However, within a week you can expect your face to return completely to normal. Around a week after the procedure, you can expect to make a follow-up visit to your dentist so that he/she can remove any stitches and check that the gum has healed successfully. Click below to request an appointment. We will reach out to you as soon as possible.